I saw this recipe in “Sale e Pepe” magazine. I modified it according to my own vision of the ingredients while respecting the principle of making the dish lighter. 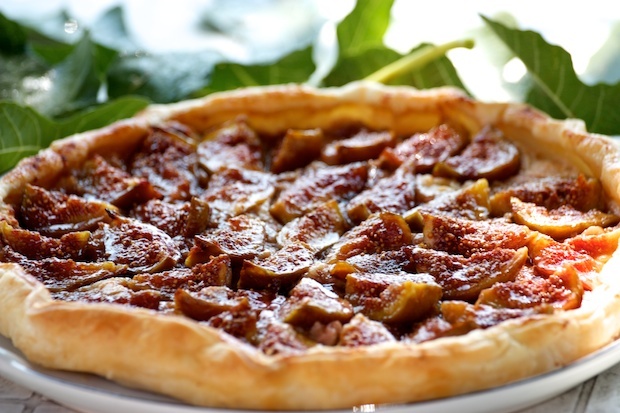 The pairing is very nice and if you like the figs, this is a recipe for you! Quick and tasty. Slice the figs into 4 parts. Add the two kinds of sugar and water into a pan. When the sugar begins to melt, add in the figs. Allow them to cook for a minute, then turn them and cook for another minute. Spread out the puff pastry in a baking pan, crumble the cookies and the ricotta over top. Place the figs over top the ricotta mixture and finish with the sauce. Bake for 30 minutes until the dough is golden. Serve still warm. The puff pastry should be eaten the same day otherwise it loses all its fragrance.